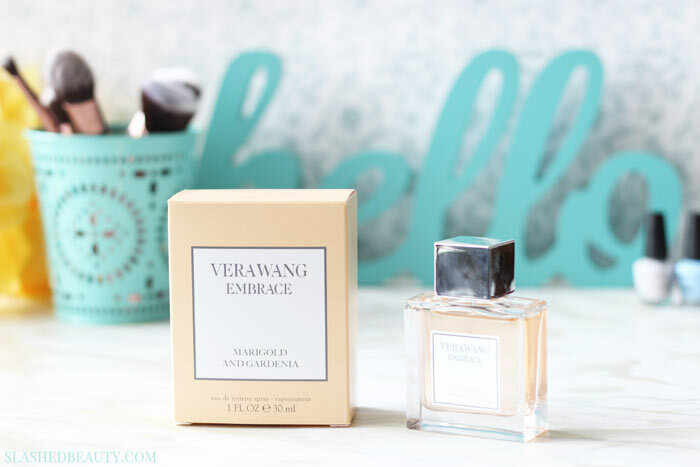 Enter to win all four Vera Wang Embrace fragrances! There’s nothing like a lovely fragrance to truly be the cherry on top of your beauty routine. I would go as far as to say that even when I haven’t got a lick of makeup on, spritzing an bright fragrance makes me feel beautiful in my own skin and confident to just prance out the door. It’s no secret that it’s hard to find a good fragrance on a budget. When it comes to perfume, my motto used to be you get what you pay for. While I normally justify the cost, since one bottle of perfume can last years, I actually recently came across a fragrance that’s not only elegant, but affordable too! 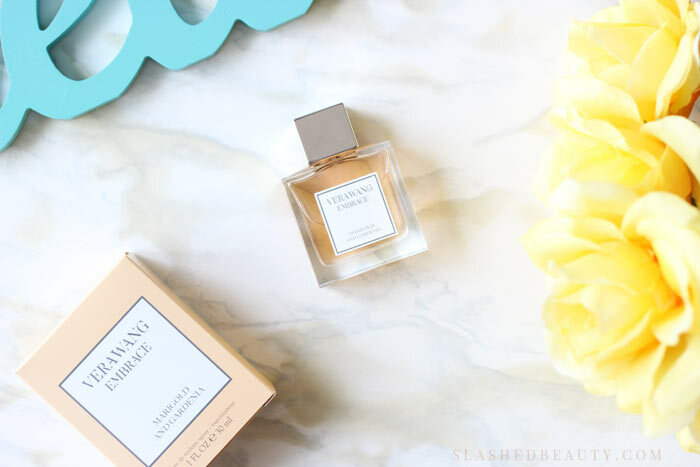 I’m talking about the newest fragrance from the Vera Wang Embrace Collection, Marigold and Gardenia. The light eau de toilette has dreamy fruity and floral notes, with just the right balance for a sophisticated and pleasant scent. The fragrance draws inspiration from celebrating intimate moments to be cherished and embraced— we all know that memories are strongly linked to the sense of smell, and this is a scent I’m glad to remember. 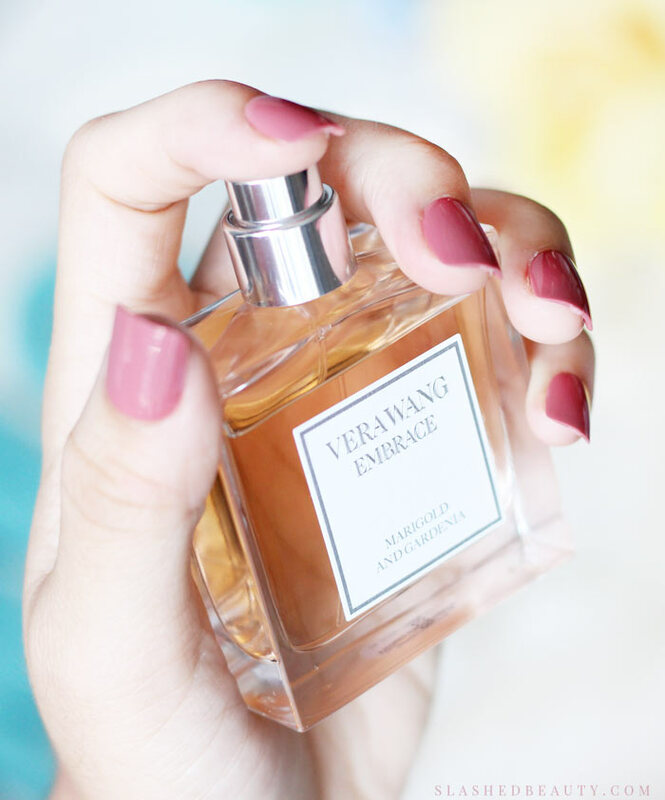 The Vera Wang Embrace Marigold and Gardenia fragrance is simple, but that’s what makes it chic. It doesn’t try too hard, but gives off just the right amount of aroma you can pick up throughout the day for a pick-me-up and to intrigue passers-by. I think the gentleness makes it perfect for year round and for any occasion, which is why I’ve been wearing it almost every single day since I got it at the beginning of May. The soft scent gives me a calming sensation, and I’m no stranger to sniffing the insides of my wrist during the day and imagining a peaceful place to give my brain a break. In fact, that’s just what this scent makes me want to do— take a break. Indulge in a little me-time. The scent really does help enhance my day and makes me feel confident and beautiful at the same time. So the best part? The Vera Wang Embrace Marigold and Gardenia Eau de Toilette will only set you back a cool $30 at Kohl’s for a generous 1 fl oz bottle. The bottle is a perfect representation of the eau de toilette itself, with simple clean lines and a soft, sweet peach color. Not only will you be proud to wear this fragrance, but display it on your vanity as well. Enter the giveaway using the widget below. Entries will close on July 12, 2016. Good luck! What’s your current go-to fragrance? Previous articleMeet Me & Get a Free Mani! I’m not a fragrance person, but I was even interested seeing your first picture. Bomb dot com! This sounds lovely, and what a great price point too! I am with ya – a great fragrance can make the difference. Sounds like there are some lovely choices in this collection – bound to be something for everyone! I am obsessed with your nail colour! What polish is that? Marigold and Gardenia sounds like a lovely fragrance combination. The Rose and Vanilla sounds heavenly. In fact, they all sound lovely. I love the idea of the kit so that there’s variety. The price is great too. I love the Rose and Vanilla! !